Back in late 2015 when an artificial intelligence program beat the European champion at the ancient and infinitely complex game known as Go, commentators around the world characterized it as a significant breakthrough. Many experts believed machines would not be capable of playing Go at the level of human professionals yet for at least another decade. But last week, AlphaGo — the artificial intelligence platform created by Google and London-based AI research lab, DeepMind — shook things up to historic proportions by defeating the legendary Lee Se-dol, who is widely considered as one of the world’s top-ranking champions in the game. 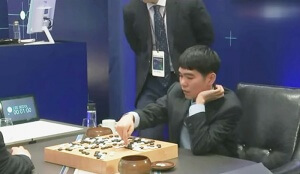 In any case, this eye-opening tournament has prompted many to speculate what this turning point bodes for the future development of AI. While some are choosing to focus on the more sensationalist “man versus machine” aspect of the event, AlphaGo’s researchers have consistently pointed out that their sights are set beyond mere games. In a recent blog post, DeepMind co-founder Demis Hassabis reiterated that the long view is to develop artificial machine intelligence that’s capable of solving urgent, real-world dilemmas, from climate change to creating more sophisticated medical tools. For starters, Hassabis believes that their continuing research into a more ‘globally’ cognitive AI will help pave the way for smarter digital assistants, smarter robots and better decision-making in AI-supported healthcare. Medical professionals can look forward to improved usability and new visualization features for medical record systems. In addition, AI-augmented applications would be capable of analyzing and manipulating large amounts of data, presenting a comprehensive context of a patient’s vital statistics and habits, thus helping to correctly diagnose and personalize the best course of treatment. Deep learning AI could help expand current models of disease pathology, serving to build the foundation for a new era of medicine. 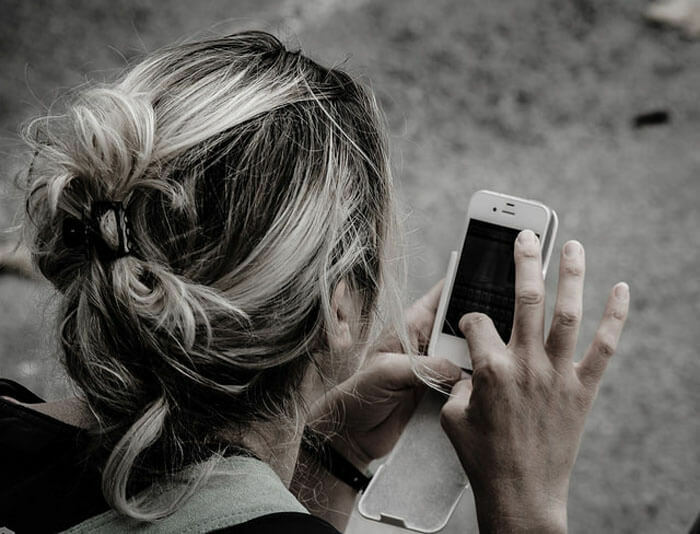 Enhanced smartphone assistants would be a huge core market for Google, supplanting current platforms that don’t perform well when confronted with tasks that go off pre-scripted paths, and aren’t quite yet capable of anticipating or contextually adapting themselves to respond to an individual user’s particular idiosyncrasies. That ‘general’ refers to artificial general intelligence (AGI), giving machines the ability to successfully perform any intellectual task as well as a human by applying a fuller range of cognitive abilities to any problem. This is in contrast to so-called “weak AI,” which is programmed to perform only specific tasks, creating machine ‘experts’ at one problem. But thanks to experiments like AlphaGo, improved and generally intelligent machine learning models would no doubt eventually trickle down into familiar, everyday tools that now already employ deep learning neural nets — like Google’s search and recommendation engines, and speech recognition. Deep learning and artificial general intelligence will very likely be integrated into tomorrow’s robots, which could encompass any type that would be directly interacting with us unpredictable humans: collaborative robots, healthcare and assisted-living robots and even autonomous cars. Perhaps even more substantial would be advanced artificial general intelligence algorithms accelerating future scientific discoveries, taking the tedium out of data-driven fields. “I’d like to see AI-assisted science where you have effectively AI research assistants that do a lot of the drudgery work and surface interesting articles, find structure in vast amounts of data, and then surface that to the human experts and scientists who can make quicker breakthroughs,” says Hassabis said. So beyond the hype surrounding this one tournament, there’s little doubt that we’ve now reached a critical juncture. So far, AlphaGo has exceeded all expectations and has done it in a surprisingly short amount of time. But realistically, as DeepMind researchers are first to point out, we are still far from the point where we might see concrete results in open-ended, real-world applications outside of the inherently more finite testing arena of games like Go. And despite some of the doom-mongering from prominent figures about super-smart AI running amok, it may be more constructive to see these recent advances as a beginning partnership between humans and increasingly intelligent machines. While it’s still too early to definitively say what’s on the horizon, there are admittedly few areas that wouldn’t benefit from smarter AI capable of learning like a human and to making meaning out of vast amounts of data, and potentially helping to develop completely new, life-changing tools — ultimately helping us humans do even better at the things we already do. 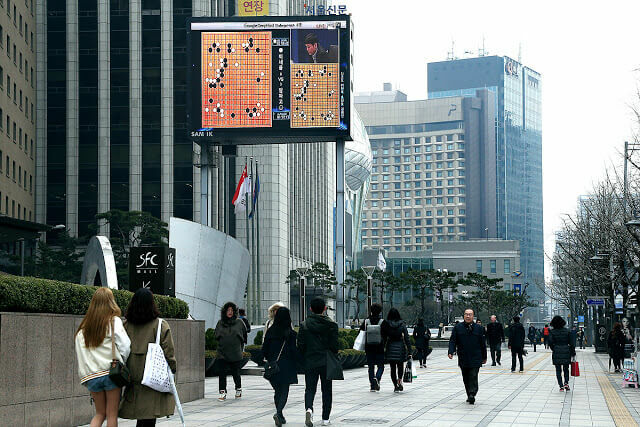 Feature image: AlphaGo vs. Lee Sedol Go match shown on the streets of Seoul, Google.